Purpose: To describe the findings of pleural and pulmonary staining of the inferior phrenic artery, which can be confused with tumor staining during transarterial chemoembolization (TAGE) of hepatoma. Methods: Fifteen patients who showed pleural and pulmonary staining without relationship to hepatic masses at inferior phrenic arteriography were enrolled. The staining was noted at initial TAGE (n=8), at successive TAGE (n=5), and after hepatic surgery (n=2). 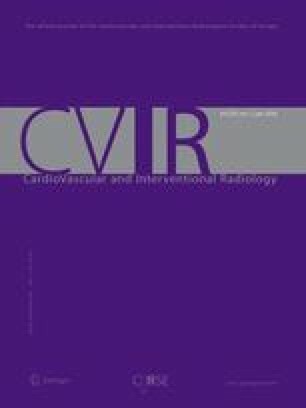 The angiographic pattern, the presence of pleural change on computed tomography (CT), and clinical history were evaluated. Results: Draining pulmonary veins were seen in all cases. The lower margin of the staining corresponded to the lower margin of the pleura in 10 patients. CT showed pleural and/or pulmonary abnormalities in all cases. After embolization of the inferior phrenic artery, the accumulation of iodized oil in the lung was noted. Conclusion: Understanding the CT and angiographic findings of pleural and pulmonary staining during TAGE may help differentiate benign staining from tumor staining.